The awarded article “SHANK proteins limit integrin activation by directly interacting with Rap1 and R-Ras” was published in the journal Nature Cell Biology. Twice during her career, Ivaska has received research funding awarded by European Research Council (ERC), which is among the most notable grants in the world and highly competed. 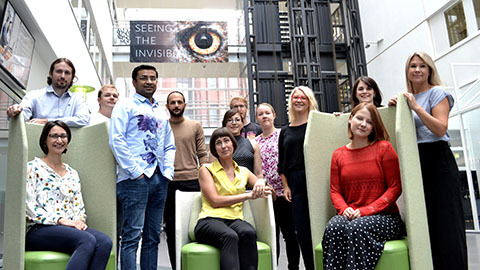 Ivaska and her academic research team are also the recipients of many scientific awards including the most recent Medix Prize 2018 for the best scientific publication in medicine in Finland, and in 2017, the prestigious A. I. Virtanen Prize for internationally recognised excellence in research. Most recently, Ivaska and her research group were awarded with Medix Prize of €20,000 for research exploring cell invasion and cancer. Medix Prize of the Minerva Foundation is a notable annual recognition for Finnish medical research of internationally high quality. In a way, it is the Finnish national championships of biomedicine. In the research, a protein that prevents the spreading of cancer was found. The SHANK protein in question limits the activity of cancer cells and prevents them from invading tissues. Correspondingly, gene mutations in this protein weaken the effect of preventing invasion. The same article brought the group also the Elias Tillandz Prize of 2018. The international, multidisciplinary research group in the BioCity lobby in Turku From left: PhD Maria Georgiadou, PhD Guillaume Jacquemet, PhD Ilkka Paatero, Doctoral Candidate Pranshu Sahgal, PhD Hussein Al-Akhrass, Academy Professor Johanna Ivaska, PhD Paulina Moreno-Layseca, PhD James Conway, Research Technician Jenni Siivonen, PhD Emilia Peuhu, Doctoral Candidate Johanna Lilja, PhD Hellyeh Hamidi, and Research Technician Petra Laasola. Photo: Martti Ahlstén. The findings of the research group are significant for understanding both the spreading of cancer and the disorders of nerve cells related to autism. – SHANK has been known to have a link with autism. A mutation in the SHANK protein or the missing of the protein predisposes the patient to severe autism, but the mechanism of how this happens has not been previously known. That was discovered in our research, too, Johanna Ivaska says. However, there is no such link between cancer and autism that having autism leads to getting cancer or vice versa. The research group continues exploring the mechanisms of cancer and autism.